Narinda Heng is an outdoor educator and field instructor for GirlVentures. 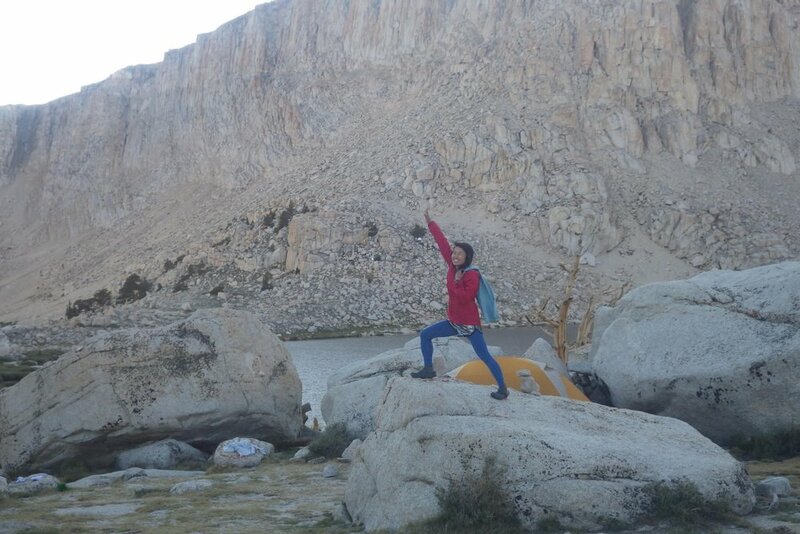 An avid rock climber, she joined the GirlVentures community in Fall 2013 as a mentor for Girls Climb On. Prior to becoming an outdoor educator, Narinda worked in the nonprofit sector in Los Angeles. She’s also worked with NOLS, Eagle Rock School, Dunn School, and most recently, the Stanford Adventure Program. When she’s exploring the great outdoors, Narinda spends her time writing and making pottery. Follow her adventures on Instagram at @narinda___. Did you have a particularly formative outdoor experience, perhaps one that influenced the direction of your life and/or career? 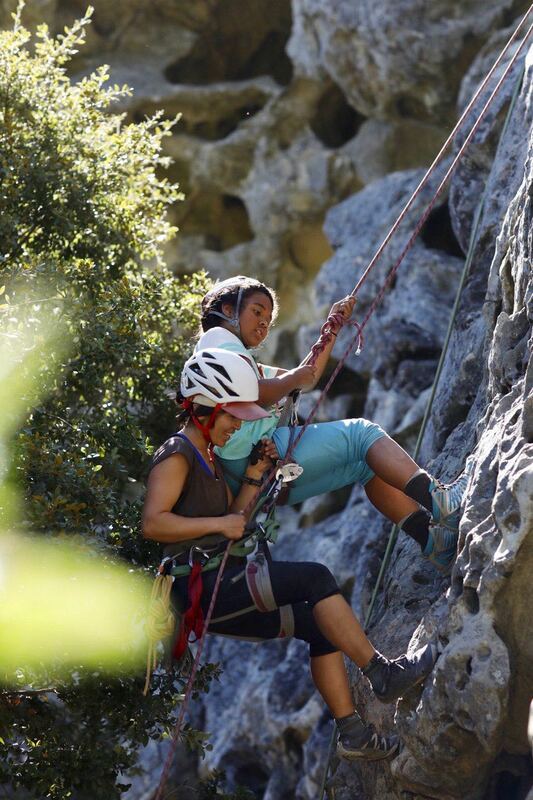 In 2014, I went on the Balanced Rock Women of Color Backcountry Adventure, a 35-mile journey along the Grand Canyon of the Tuolumne River led by Chelsea Griffie and Elizabeth Sy. It was the longest and farthest backpacking trip I had ever taken at that point. I met Chelsea through my interest in learning about women of color climbers (she was the first African American woman to climb El Capitan), and she told me about this trip which she founded in 2004. I was thrilled to learn that Elizabeth, her co-leader, was also Khmer American. I applied for tuition assistance and scraped together funds for the rest of the cost through video and audio transcription work and selling chapbooks. It was so, so worth it. We were a multigenerational group from all over the country. I got to spoke Khmer in the backcountry with Elizabeth. We ate rice porridge with pork floss and a coconut curry-- flavors that I had not considered bringing to the backcountry, and why not? Sweating up steep trails, walking past rattlesnakes, and swimming across the cold Tuolumne River with fellow women of color felt something like freedom. I realized that there are ways to bring all of myself to the outdoors, and I work at inviting students to feel comfortable bringing as much of themselves to the outdoors as possible. Why did you decide to be an instructor of outdoor programs? What motivates you to continue instructing? I ask myself this often. What I’ve taken to tell younger folks who are thinking about doing these things, or trying to decide whether to do them now, is that we only have so much cartilage. My body is only getting creakier. Over the last year in particular, I’ve realized that a significant part of why I began and continue in this work is knowing that I’m not the image that pops into someone’s head when they first think about what a rock climbing or backpacking instructor might look like, sound like, think like. I’ve found that the community building skills that I developed with Tuesday Night Project and Public Allies Los Angeles are also important when leading outdoor trips, and that group travel creates a amazing environment for practicing conflict resolution skills, learning to identify and speak our needs, and creating community. I learn so much from my colleagues and from the young people we’re fortunate enough to spend time with. Further, I do this work because it never occurred to me to do it-- because I never saw myself out there, and because I want to be there to show that we can be out there no matter our ethnicity, age, body type, gender, economic class. How much of the year do you spend instructing? What other hats do you wear? For the last 4 years, I’ve spent from 10 to 70 days a year as an instructor. I also work as a climbing instructor at Bridges Rock Gym and at the Stanford Adventure Program. Otherwise, I spend a significant portion of my time making pottery and writing. Tell us about one of the courses you led this summer. What was your role? Any favorite moments? I was the Rock Specialist for both Redwood Adventure Rock and Transitions this summer. I hiked in early with ropes and gear to build the anchors for the climbs, taught students belay and climbing technique, and managed the climbing site with the help of the instructor team. There were eight girls on each of those trips. One moment that sticks out in my mind is a student on Transitions who had had little or no climbing experience and was afraid of heights. By our second climbing day, she repeatedly said, “I feel so strong,” flexing her muscles. Did any participant experience a significant breakthrough while on course? How did the girls respond to the experience? The first part of our On The Rise backpacking trip included several hail and lightning storms. It was an intense introduction for first-time backpackers. On the second half of the trip, we got a break from the challenging weather and successfully summited Mount Langley, a 14,000-foot peak. Everyone was exhilarated. On our descent, one student said, “Oh no, now my mother will think I can do anything.” It is so powerful to witness students push through doubt and find themselves standing strong on the other side. Why should someone else get involved with or support GirlVentures? Since joining the GirlVentures community in 2014, I’ve felt incredible support in my growth as an outdoor educator and as a facilitator. I have been nurtured in my ability to hold space for students to bring their whole selves to our trips, and I’ve also felt able to bring my whole self to GirlVentures. We have discussions about gender, race, sexual orientation, oppression, class, the many -isms that impact the way that young people-- and we as instructors-- show up in this space and in the world. I keep coming back to GirlVentures because I believe in young people, because I believe in the work, and because of the way we work-- with an awareness of our contradictions, a desire to do better, and a commitment to our values and to one another.